I have had a serious discussion with some players and have come up with an idea to stop trolls and to make sure players do not progress to quickly up the game. This way a player most battle and actually try to do a lot of damage before moving up. I am personally getting sick of players sitting at spawn spinning there turrets around or players to scared to have a go. Maybe after tier 8 reduce it to a min of 2nd class to go up. Edited by YodaJediMaster, 13 June 2018 - 04:05 AM. That Won't stop "Trolls", I think what you're trying to do is to introduce a Tier Graduation requirement... unfortunately that would be a bit late since the proverbial horse has already flown. Of course, WG could enforce a complete sell-off of every-players tanks, so that we all start from scratch again... that may allow such a system to be introduced ? Yes trolls does not equal to, newbies or, those who can’t learn.... they are 3 different characters. If trolls or aka “idiots” (those serious one like afk, blocking etc.) you are referring to, then they have no biz to be allowed to continue trolling in wotb. One suggestion since wg is a $ making entity, make these trolls pay to lift the ban for them to be able to play again. Give warnings and temporary ban initially. And after all these the player continue to receive many complaints (e.g accumulated 100 complaints) they will have to pay to lift the ban... e.g $5 first time, $10 next..... but give warning b4 the ban. Make these idiots pay to troll and at the same time help wg make some money if they decide to pay to troll. For the 2nd/3rd character, something like Learning academy, test/tier graduation and short videos on different topics will help. Limit the number of games in higher tiers they can play if they cannot pass the tier graduation. then how will newbies/average players like me ever go up when i cant even get ace on one of my t7 tanks? If you did implement this you should do it the other way around. Tier 1 requires nothing to move up to tier 2. Tiers 2 and 3 require a 3rd class in order to get into the next tier. Tiers 4 and 5 require a 2nd class in order to get into the next tier. Tiers 6 and 7 require a 1st class in order to get into the next tier. And ties 8 and 9 require an ACE in order to get into the next tier. As for premiums, you can buy them but you can't play them until the above conditions have been met. This will put a dent into premium sales so it wont happen. P.S. Looking at my own stats, the above rules will put me a tier 8 as I don't have an ACE at tier 8, even though I have one a tier 9. Edited by TinDingo, 12 June 2018 - 11:37 PM. A in-game voting system is more effective, more than 4 votes and kick the troller out or give the ability to your team to damage him and penalize him afterwards similar to the one in TF2. Unless you got mixed with 6 bots and trolls, you should be able to kick the troll out. More than 4votes is too little. It just take 2 troll platoon to get some innocent players banned. Mob rules the current mh system if you realise. It is not difficult to identify one type of trolls. Low damage, low wr, absolutely untrustworthy player. How hard is it to identify them and deal with them? It is up to wg if they have the courage and the will to rid of them in wotb and deal with them. The following type of troll is more difficult to identify but equally annoying, and whether they warrant any action to deal with them. They usually have characteristics as such, 40% wr, average damage, absolutely untrustworthy or untrustworthy player. These trolls, spawn camp, don’t move or camp, move very late in game, hide while others doing battle, always go the other direction from team alone, always yolo and get killed at the start of game.... etc. Learning academy or tier progression test or something to help them learn to play may help. But what about those who choose not to learn and continue to troll? Do we deal with these trolls and how to if we wanna? Btw majority of the trolls fall into this category. Edited by bigben21, 13 June 2018 - 02:29 AM. What if a 55-57% player with Blue or Purple MH rating and decent stats suddenly decides to try trolling his teammates like the regular trollers we know and loath? I've seen it happened, and -1 to luck because I was the target. Guy kept blocking my back and even announces his trolling intent at the start. Not even joking, his line was something like "Time to troll" "Hehehehe". Edited by Diamond114, 13 June 2018 - 03:45 AM. "Fight to fly, fly to fight, FIGHT TO WIN!" - U.S Navy Fighter Weapons School TOPGUN. "Nothing is right in tactics. A good fighter pilot must be free to propose improvements to his tactics or he will get himself killed." - Cmdr. Randy "Duke" Cunningham, USN. This is not for players that are already playing, this is for new players. It is not hard to get 1st class or an Ace Mastery if you try hard enough, even if you have multiple tanks of that level. This idea is to stop trolls from sitting at spawn getting xp and moving up and players that do not even make an effort. If you cannot get even get a class 1 mastery in a low level there is something wrong and maybe you should look for some you tubes from Sk8xtrm, Bushka or others on tips how to play. This will stop trolls as trolls would have to play to progress up a tier, it would force them to get a Mastery 1st class or Ace before they can climb a tier. This would be for new players and those who re-roll or get banned. Hold on there... I understand the frustration that you have with "Trolls". Though shall we first be clear on what you mean by troll, so that we're all on the same page. * A newbie in a Gold Tank. * someone who drops out of the game but rejoins due to technical issues. BTW. The suggestion for graduation to the next tier sounds good - it's like most other games where you need to complete a certain level before moving onto the next, however the proposal to use Ace / Mastery would appear to be flawed since the first player of a new tank would instantly get promoted to Mastery, or if no one has played a tank for a week, then similar progression would arise. Likewise, it does not account for the tank NERF'ing that goes on between releases to make 0 comparison of W/R/DMG, etc. comparable between new players and old. Furthermore, as more and more players achieve Mastery/Ace within the same period, it becomes harder for other players to achieve it. .... so that is not, imho, not a good way to set the progression between Tiers. Perhaps a fixed number of battles per Tier per tank, and some other stat goals need to be achieved before moving on ? Using BlitzStars as an example, Light tanks, should have a Spots Goal, and TD's a DR/KPB goal. Each stage in a tank series would have a series of check boxes showing your progress before the next level, which would be independent of Tank armament. 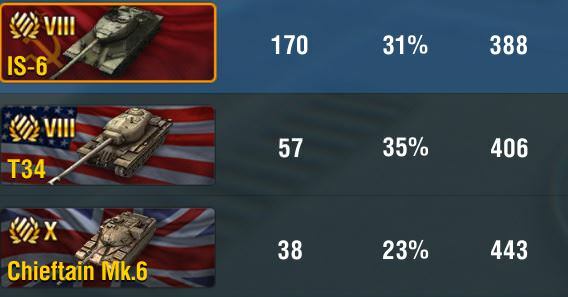 The only way, WG could enforce this, would be to make everyone have to recertify their Tier progressions by placing them all back on Tier 1 again before being able to reclaim their previously owned next Tier Tanks (Re-certification battles would have to be outside of the normal Garage slots as you may already have max'd out your slots at different levels). You just wont be able to play those tanks again until you re-certified all the prior levels. Normal Gold Tanks, would remain the wildcard, you just don't know who has one. And the Fantasy tanks, should be restricted to their own games - Drac, Helsing, etc. Edited by Creighton_Abrams, 14 June 2018 - 05:41 AM. The Appraisal system is flawed too for identifying Trolls - "Inactivity in Battle", and "UnSporting Conduct" are widely abused, for example if you are platooning with someone, and you both assign the same player the same Negative appraisal, then that will immediately be assigned to the player. WG does not verify the appropriateness of such assignments, nor will Support change any, so that in itself is like giving a free ticket to "Troller" Clans... and there are a handful out there. The Video replay function is sort of helpful as it will allow you to pinpoint precise Trolling actions to the Support team - though on the downside, it will (assuming they wish to take action), require more effort upon their behalf. If you do send them, I guess you should identify the exact time-periods (as shown on the LHS of the screen). Network issues are often used by some players to explain why they block you or sit idle, or simply continually spin... following the recent release in which server issues plagued us all, I can relate to some of those actions having seen my own tank career into walls, off Cliff edges, etc - but that was exceptional, there needs to be an acceptable network quality before players can join a game, or at least a warning to the effect that the game may be unstable. Though what is an acceptable ping ? I mainly play the PC versions, and start to notice issues when ping goes above 130. However the Antipodean players report that they have far worse ping times but are yet still able to play. Some people have also said that the impact differs between platforms, iPhone/iPad being less impacted than PC... but I cant verify any of these other than my own experiences. So, how do we recognize these issues impacting players in our own team ? One way, could be like the Gun reload display for each player, where the game would color each Green, Orange, Red depending upon Ping/Responsiveness quality. But, during the game I doubt many will be monitoring these as they should really be focusing upon their own game play and that around them. 1. Invite them to a training room that says ‘Fun Room’. 6. If that’s not dirty enough? 8. This will give them a penalty. 11. Get all your friends to download spam bots and destroy their game completely. 12. Last resort if your’re actually pissed, infiltrate account and sell everything. (Brute Force Hacking, JeuxVideo). Remember, this is only for trolls. So please don’t go smashing a nub for being a ‘nub’. It happens to all of us at one stage. I've come across the same Troller in a couple of games, this time, I have sent the video to Support... not sure how much good it will do. And me along with it... and with 0 damage too I'm subject to "Inactivity in Battle" !!!!! of course, our team lost. This is the type of player I would like to meet 1 on 1 in person. Clan name and Troller available upon request.... but I guess you probably already know who I'm talking about... they like to refer to themselves as a bunch of South American Women known for Fighting (or a Forest there), and this player in question is the Commander who names himself after a large nut. 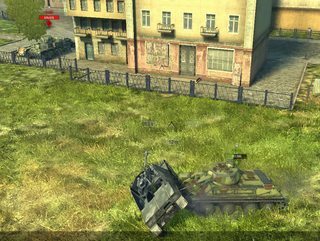 Edited by WoTBlitzPlayer, 14 June 2018 - 03:30 PM. Yes these are trolls that should not have being allowed in the game, at all. No reason for their presence! It is stupid to even allow them to ruin the game. WG is weak when dealing with such trolls. Instead of a permanent ban for such trolls, some players were imposed ban who ranted at these idiots in their private chat. Seriously? Edited by bigben21, 14 June 2018 - 03:58 PM.